Welcome to the South Tonka League of Women Voters! ​Shorewood, Tonka Bay and Woodland. All individuals 16 years or older are welcome to join or attend our events. All LWV South Tonka Members are invited to attend any or all Leadership Team Meetings. ​We would love to have you attend, look forward to your participation and learn about the LWV and help us provide leadership and education for our communities. Our annual Mayors Forum was held on February 28. It was well attended and provided Mayors the opportunity to address city and coordinated issues. The Forum was recorded by Lake Minnetonka Cable Commission (LMCC), with the link below. If you are interested in the League of Women Voters or any of our events, Please CONTACT US for more information. Kay was chosen as Producer of the Year for her cable news show entitled "Talking Points".All of the programs revolve around the work that the League does and showcasess topics of interest to the audience. Check out the new Talking Points programs regarding services for youth in our area. Links are listed below. ​Since early spring, members of the LWV - SouthTonka have been speaking to a variety of knowledgeable State, County, School and Service Providers in our suburban area to understand the service needs and services provided to our youth. ​We are sharing the information we have gleaned in our Talking Points, videos produced in collaboration with the Lake Minnetonka Communications Corp.
See the Talking Points interviews below and find information regarding youth services in our area. ​Please join League of Women Voters St. Louis Park and the St. Louis Park Human Rights Commission for a presentation and discussion of the possible effects of the citizenship question. The results of the U.S. Census could impact the future of Minnesota and our local communities. The League of Women Voters is celebrating our first 100 Years. Their will be an exhibit sharing the LWV Minnesota's contribution. "A Century of Civic Engagement,"
Presented in honor of the 100th anniversary of both LWVMN and LWVSP. Exhibit will be on display from April 26 to May 28. ​Opening reception is in Landmark Center’s North Gallery (north end of first floor). Light refreshments will be provided. ​at Home and Around the World"
Renowned journalist and New York Times bestselling author Cokie Roberts will share touching first-hand stories of the issues she's encountered through her work on several nonprofit boards. and inspire us all in our role as global citizens. It’s been a long road to get to this day, and now that we’re finally here, we have a real chance for the Court to set a standard for fair districts across the country. With the inclusion of the Benisek v. Lamone case out of Maryland, which the League of Women Voters of Maryland joined as amicus, the Court will hear about instances of partisan gerrymandering by both Democrats and Republicans. This presents a huge opportunity for the Court to assert that, once and for all, politicians cannot choose their voters—voters must be free to choose who they want to represent them. Read about the background and legal theories behind each case in our latest blog post. Banning partisan gerrymandering would make huge strides in restoring voters’ faith in the electoral process. Voters must know their votes make a real difference and that they are not just used as pawns in a political game. Please join this effort, either in person or via live video on Facebook. ​Hope you enjoy these excellent videos hosted by current LWVST and former LWVMN president Kay Erickson. These videos are produced in partnership with the Lake Minnetonka Communications Commission (LMCC). If you have ideas for future broadcasts or would like to be involved in production, please contact us. TreeHouse brings hope to youth at risk and helps families, leading to life transformation. The LWV's Kay Erickson interviews Patricia Hauser, founder of Humming for Bees and Lex Horan, Organizer with Pesticide Action Network. ​The LWV South Tonka's Kay Erickson & Peg DuBord interview Sandy Mangle, Clinical Supervisor/Therapist at Relate Counseling Center in Minnetonka, MN. This program was produced in partnership with the League of Women Voters - South Tonka and the Lake Minnetonka Communications Commission (LMCC). The LWV's Kay Erickson and Karen Schaffer interview Metropolitan Council members Jennifer Munt (District 3) & Katie Rodriguez (District 1). Kay interviews Minnesota Governor Mark Dayton on his "Year of Water Action Initiative," and speaks with Gretchen Sabel, chair of the LWV UMRR ILO which focuses on issues affecting the upper Mississippi River region. LWV South Tonka interviews Pam Langseth from Open Hands Foundation and Richard Coffey from 180 Degrees about Hope House, an emergency shelter and treatment program for teens in crisis. ​LWV South Tonka member Kay Erickson interviews Metropolitan Council Member Jennifer Munt (District 3) on the proposed Southwest LRT project. MN Votes - For Secretary of State voter & election information. WHO CAN VOTE IN MINNESOTA? LWV Minnesota provides many resources for members and the Public to become updated and informed on the latest issues. Subscribe to Action Alerts to know where Bills are in the Legislative Process. Subscribe to the Capitol Letter to keep up-to-date on Legislative Activity. Like - the LWV Minnesota’s Facebook page here. The most respected and valuable way to get your Legislators Attention is to write them a personal letter. LWV Minnesota's positions on public policy issues are called its Program for Action. LWV Minnesota takes positions on a broad range of issues. Because LWV Minnesota is part of LWV United States, it automatically adopts all positions within the LWVUS Impact on the Issues 2016-2018 publication. LWV Minnesota has also adopted state-specific positions as well, which you can read in our Programfor Action 2017-2019. LWV Minnesota adopts positions based on careful study and consensus. To adopt a position, members must conduct sanctioned studies on an issue for a two-year period. The recommendations from the study are brought to the larger body for a vote, and if approved, become part of the official positions supported by LWV Minnesota. The positions formed through our study process are the basis of our advocacy work. Local LWVs may also adopt positions at the local level relating to local issues. While League of Women Voters never supports a particular candidate or party, members do advocate for our adopted positions to any/all political bodies that are necessary to achieve the positions stated in this document. To learn more about these topics, you can read a short summary of select Program for Action positions.. Learn more about how LWV Minnesota adopts its positions. ​Recently some in the Minnesota Legislature are proudly crowing about their successful efforts to stonewall any consideration of common sense measures that would reduce the epidemic of gun violence our children face. In the face of the Parkland FL tragedy, how can anyone remain silent for one more minute, much less have the vulgarity to proclaim the Congressional failure to act “good news?” How is this senseless slaughter any less a crisis than opioids, traffic safety or a hurricane? The League of Women Voters Minnesota has a 99-year history of activism in Minnesota on issues affecting our families, education, health care and voting rights. Taking steps to curb this epidemic is not just a Second Amendment issue — it is a devastating national emergency. Gun violence is a family issue, as we’ve seen when domestic abuse becomes deadly and children are left without a mother. When children go to school in a climate of fear, how can we expect them to learn? Our children should not have to fear “being hunted” in their schools! Gun rights advocates cry that this is a mental health problem. They’re right, but what steps have they taken to keep guns from mentally ill people? Our organization also supports legislation that provides adequate and consistent funding for treatment of people with mental illness, including housing options and long- term care. The League of Women Voters will be present in St. Paul, Washington DC and across this country on March 24 at the March for our Lives in support of rational change on gun laws in this country. While lawmakers brag about blocking common sense legislation, young people are showing them and all of us what it truly means to lead. The League of Women Voters is proud to walk with them and will be there with election information and voter registration forms. We will also encourage all voters to do more than march; they must vote. ​Their voices will be heard on March 24 and in November elections. ​Unsafe water, hope for the future, advocacy needed! 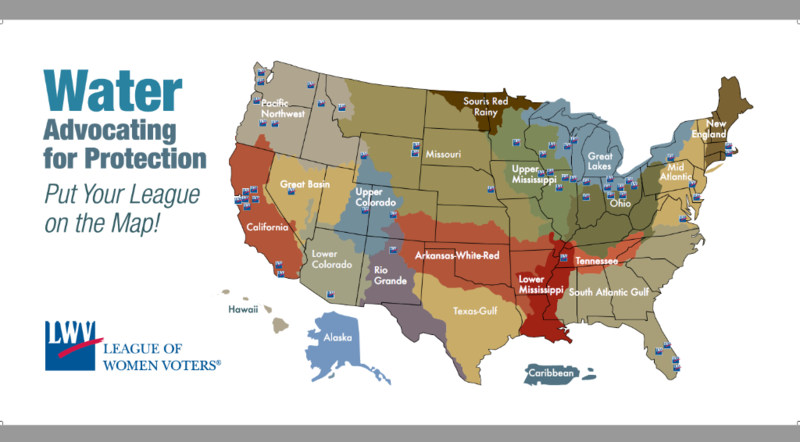 The Watershed Game is a great tool for teaching watershed literacy, and all Leagues that are members of the UMRR ILO are recommended to get a leader trained in facilitation. Thanks to a grant from One Mississippi, LWV is offering training in Rockford Illinois this summer - check it out here. ​An excellent analysis of the pros and cons of copper-nickel mining, from our friends at Citizen's League. 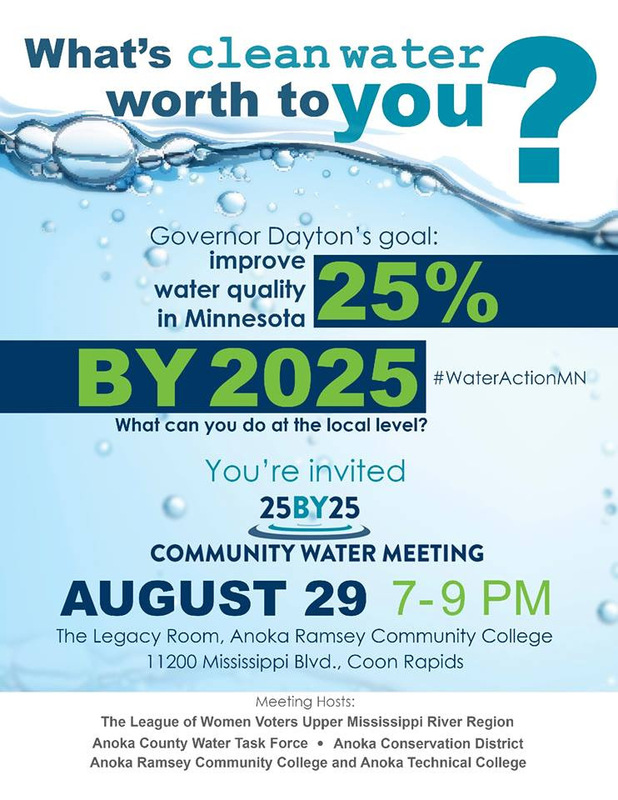 Minnesota Governor Mark Dayton's water initiatives. 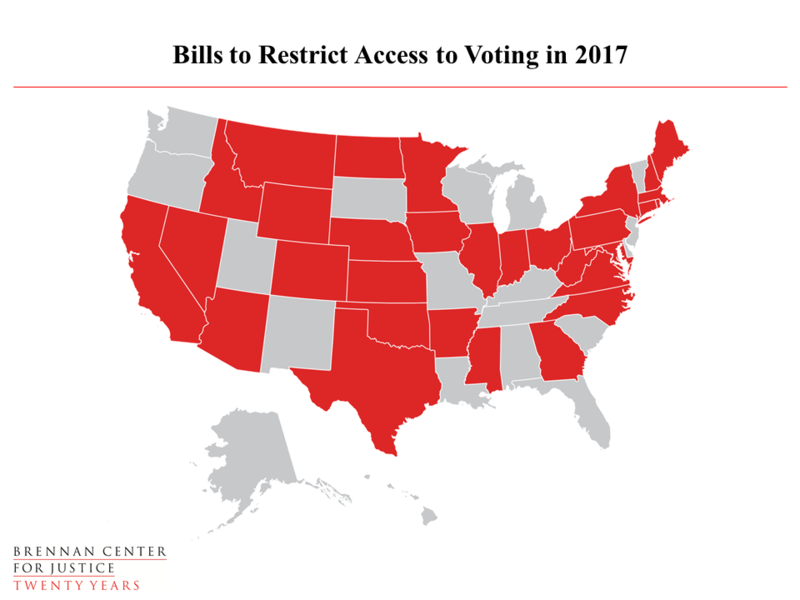 Overall, at least 99 bills to restrict access to registration and voting have been introduced in 31 states. Thirty-Five such bills saw significant legislative action (meaning they have at least been approved at the committee level or beyond) in 17 states. Read the latest updates to the roundup compiled by The ​Brennan Center for Justice HERE. The LWV MN website "Your Vote Your Voice" is designed to be used as a resource for all to understand the past, present and future of voting rights. The site houses a wealth of content exploring the long history of voting rights in the U.S. and invites students to help create ideas to improve participation. The goal is to encourage students to get active in local politics. The site is the result of a collaborative effort between LWV MN, many volunteers, and 11 partner organizations who helped contribute content. The League sent a memo to members of the U.S. House regarding HR 634, the Election Assistance Commission Termination Act. The Election Assistance Commission (EAC) is the only federal entity devoted exclusively to improving election administration on a bi-partisan basis. The League does not believe terminating the EAC is warranted and urges the Committee on House Administration not to report this legislation. Members of the LWVUS Lobby Corps will also be addressing this with select House offices. Developing educational programming to increase the public’s understanding of the natural resource issues in the region. Coordinating advocacy efforts across state lines and in numerous congressional districts to promote the collective interests of the region before Congress and the federal agencies. Monitoring local, state, regional, and federal proposals that affect the interests of the region, distributing that information and making recommendations to the appropriate state or local LWVs for action. The League joined a letter to members of Congress opposing efforts to overturn the Bureau of Land Management’s Methane and Natural Gas Waste Rule under the Congressional Review Act (CRA). The BLM rule is a common sense policy that requires the oil and gas industry to reduce venting, flaring and leaks on public and tribal lands by deploying methane mitigation technology. ​The Price on Carbon Steering Committee hosted a webinar, The Case for Pricing Carbon, featuring internationally renowned science historian Naomi Oreskes. Dr. Oreskes explained the economics of carbon pricing and fielded a range of questions from the webinar audience. A recording of the webinar, together with slides and handouts, is available on the Price on Carbon website HERE. On Thursday, November 8, a federal judge ruled that youth plaintiffs may proceed with their historic climate change lawsuit in the case of Juliana et al v. United States. The judge refused to dismiss their complaint asserting that, in causing climate change, the federal government has violated the youngest generation’s constitutional rights to life, liberty, and property and has failed to protect essential public trust resources. Read more HERE. ​The League recently endorsed, and is encouraging members of Congress to cosponsor and support five pieces of legislation known as the Frack Pack. The Frack Pack bills will close loopholes in the Safe Drinking Water, Clean Water, Clean Air, and Resource Conservation and Recovery Acts while establishing mandatory testing of water resources to contain contamination. Read our most recent blog on our work to address the threats around fracking. LWVST supports the work of local non-profit Humming for Bees in their effort to educate others on the issues affecting our pollinators. Visit their website for more information and to see how you can create a Bee Safe Yard! How Can You Support Bees? Learn the facts. Read the latest LWV MN briefing paper "The Impact of Neonicotinoids on Honey Bees," and Pesticide Action Network's fact sheet "Bee Decline in Minnesota." Organize a meeting. Talk to your local League about holding an LWV or public talk on bees. Visit www.LWVMNbees.org for resources. Shop for non-neonic plants. Read "Ask B4 U Buy!" on how to shop for bee-safe plants and flowers. Support "H.R.1284 - Saving America's Pollinators Act of 2015" legislation. Follow this link to find your elected officials. Read the LWVMN briefing paper, "The Impact of Neonicotinoids on Honey Bees." The effort involved three of our LWV-ST members who led a committee to write the paper and prepare an educational toolkit. Resources include a PowerPoint presentation, meeting templates, and other resources for local Leagues to educate their members and communities on the issue. All items can be found on the www.LWVMNbees.com website. ​September 8, 2019 will mark the centennial for the State of Minnesota to ratify the so-called 'Anthony Amendment,' receiving approval from both the House and Senate on the first day of a special session on September 8, 1919. In 1920, the 19th Amendment to the U.S. Constitution received approval from three-fifths of the states and the right to vote was extended to women. The Turning Point Suffragist Memorial Association (TPSMA) is building a national memorial to American suffragists – with a special focus on those imprisoned at Occoquan, VA, who endured harsh conditions and abuse to win voting rights for American women. The memorial will honor these brave women and provide awareness and education about how their courage, methods and commitment led to the passing of the 19th Amendment to the Constitution. Our goal is to see a memorial built and fully operational by 2020, the 100th anniversary of the ratification of the 19th Amendment, which will be built the Northern Virginia Regional Park Authority’s Occoquan Regional Park. To learn more about the memorial: Turning Point Suffragist Memorial. With your help, we will educate, inspire, and empower present and future generations about the struggle to gain voting rights for women. You can help by sharing our website with your members in your newsletter or on your website connect to our link, have a speaker on suffrage, read about suffrage history, or hold a local event. As a member of the Turning Point Suffragist Memorial Association (TPSMA) National Board representing Minnesota, I believe you will agree, we owe these women the honor of a National Memorial. If you have questions or need additional information, please feel free to contact me. ​advocates, educates and encourages informed and active participation in all levels of government. Like what you see? Consider becoming a member today and having your voice heard!